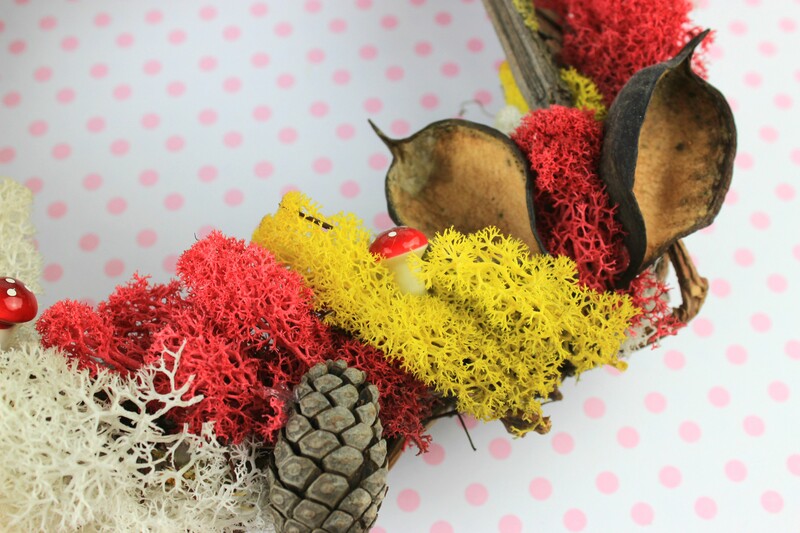 DIY Spring Wreath with Moss and prepare your home decor to welcome Spring! Sping without color and flowers and wreaths, actually cannot be considered as Spring! To be honest this was not my opinion in the past, regarding the wreaths of course, since I was considerring them something difficult to create. 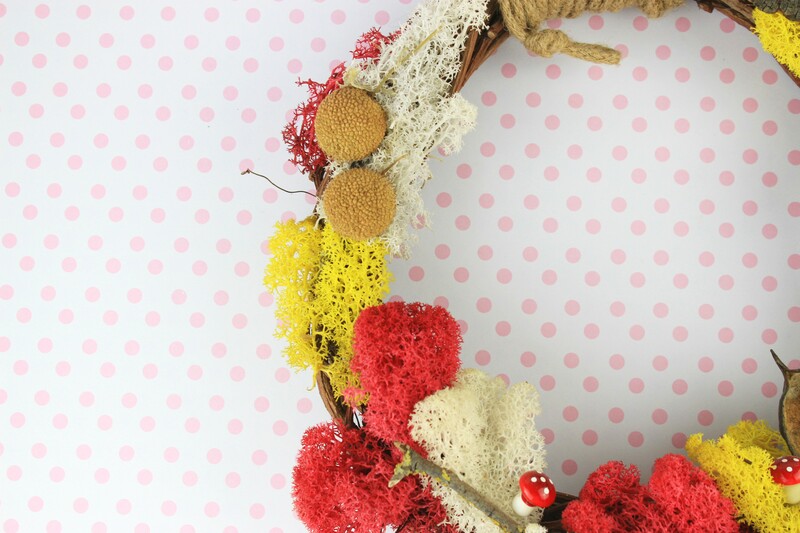 I cannot explain that, but I have never tryied to create a wreath with flowers…but there is always the first time! What happened? I saw my beloved wood hoops for embroidery and I decided to create something with flowers and ribbons. And that’s how my first really simple Wreath with Flowers created! Things changed after that and now I really adore this kind of crafts. Everytime I challenge myself to use more materials or to try something new and then you realize that you are addicted on wreaths! This time I have used more moss and this is how my Spring Woodland Wreath with moss created! If you are lucky to leave in countryside, then it would be really easy to collect materials from trees or forest. If you are from the guys (like myself) that you leave in big city, then just have a walk in your neighborhood and collect whatever you can from trees….else you need to purchase them from any online store. The best season to gather materials for me is always Autumn because of the colors of the trees and Winter because the nuts are dried, so everytime we try to have walks in the forest and collect things to use in our crafts. Store them and use them whenever you need to have something in woodland style. This time I wanted our wreath to have moss in many colors. The reason? Because I wanted to decorate our fireplace which already has a small magical village with tiny elves. 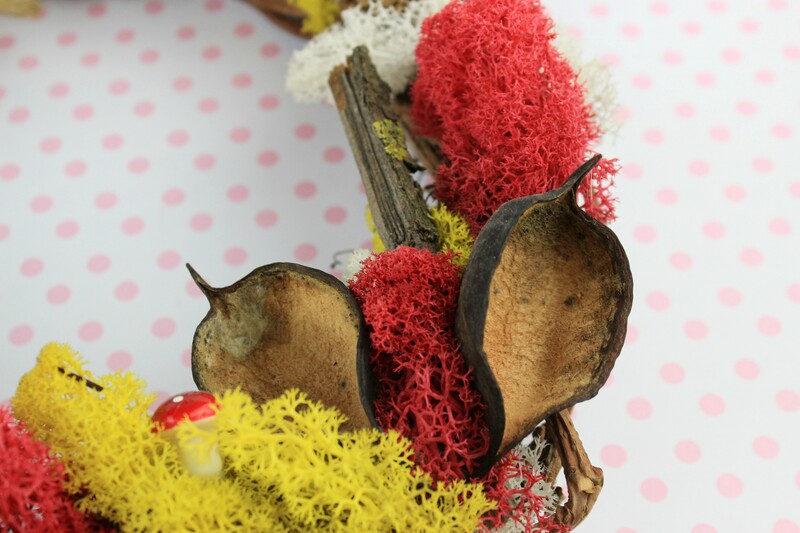 Some of the elves are having fun in the embroidery hoops and others just playing with mushrooms! So the moss were just perfect, but this time I wanted more color and not only green. Imagination, free time and let’s do it. 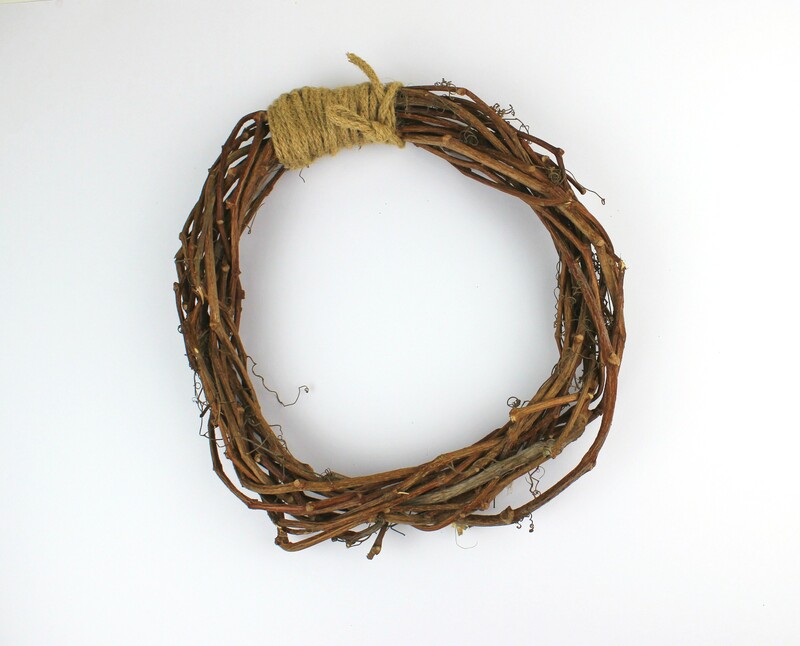 The easiest way to prepare the base wreath is actually using grapevine branches or eny thin branches, which are easy to curve. Just bend them to create a circle and then use wire to close the loop. If this is not the case for you because you cannot find think branches or because you are bored to bother with that also (yes…this is what happened with me also), just purchace a simple wooden wreath and use it. Let’s start decorating it. Hot glue and materials just close to you and start putting them on the wreath, like we did with the Woodland Wreath with Embroidery Hoops. 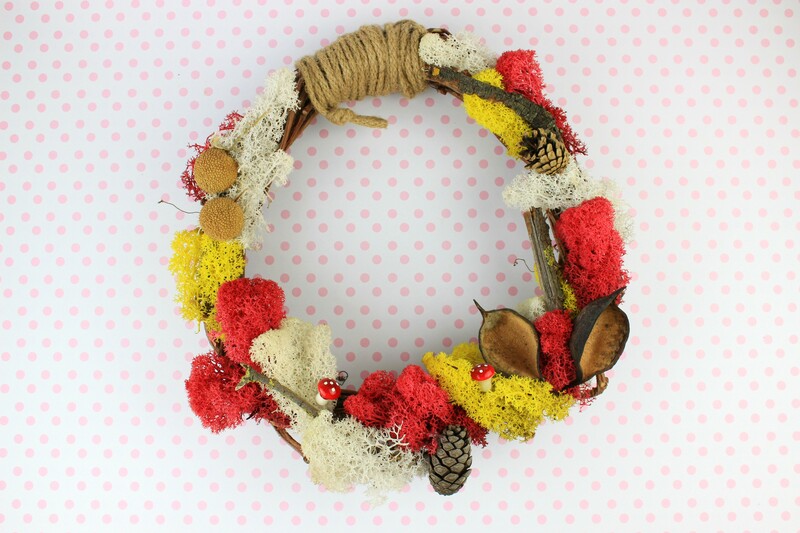 Moss in various colors and small branches and pine cones and dried nuts or flowers, hot glue to stabilize them and your wreath is ready! I have used also tiny mushrooms for a cute detail! The wreath is ready and I really like its color! It is already in our fireplace among the other crafts with moss and the Fairytale land with the cute elves is akready in my heart! 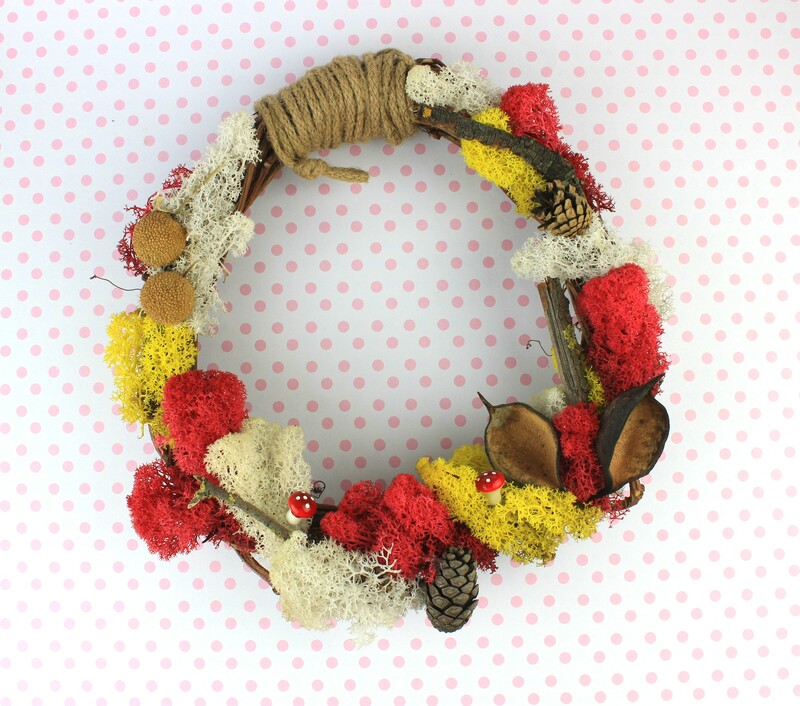 So… have you created any wreath for the Spring?